Design a sectional that fits your room with the correct dimensions and amount of seating for you and your home. Combine different pieces to build a sectional with pieces that fit your style and space. This flexibility can be fun and allows you to set up a room you are proud of while meeting all of your needs. Need a large seating unit for your large living room or entertainment room? 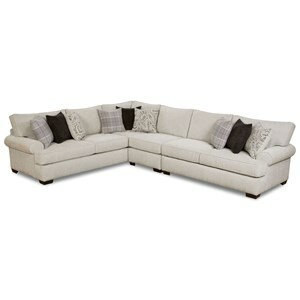 Look no further than this unique sectional sofa with chaise. Featuring large, plush pillows and soft fabrics. A chaise at the end of the sectional allows you to sit back and relax effortlessly. Whether watching your favorite movie with friends or lounging with the family on a quiet weekend, this sectional sofa fits your lifestyle perfectly while showing off your trendy style. 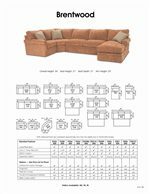 The Brentwood Transitional Sectional Sofa with Chaise by Rowe at Thornton Furniture in the Bowling Green, Alvaton, Glasgow, Scottsville, Franklin area. Product availability may vary. Contact us for the most current availability on this product. 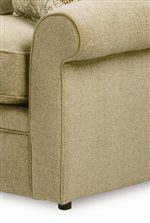 9258-RSE Right Seat End 1 94" 40" 35"
9254-000 LAL 1 63" 40" 36"
9251C-LSC Left Seat Chaise 1 33" 68" 36"
Fabric Options Special Order Fabrics. Padding & Ergonomics The standard 300cc cushion consists of a high-resiliency polyurethane foam core for the right amount of support, sink-in comfort and bounce-back. It is then wrapped in a layer of plush polyester fiber for softness and shape. Feather Soft and ExtraPlush (M850) Cushions also available through special order methods. 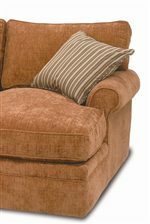 The Brentwood collection is a great option if you are looking for Transitional furniture in the Bowling Green, Alvaton, Glasgow, Scottsville, Franklin area.